12 oz. capacity Attractive Pathways design Can be used safely in a microwave Perfect for soup, chili, ice cream. 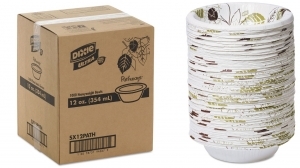 Soak proof, cut resistant 8 packs of 125 bowls = 1,000 bowls Elemental chlorine-free Sustainable Forestry Initiative certified Moisture resistance, grease resistance, dry and wet rigidity make Dixie Ultra paper bowls a strong ally. A unique multi-layer design is responsible for the remarkable inner strength of Dixie Ultra bowls. Multiple layers combine forces to stand up to the heaviest, messiest foods you serve.